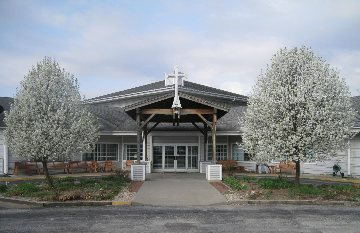 Upon entering main retreat facility referred to as The Dr. Paul Spitz Center (Spitz Center), named after a former President of the Missouri District of the Lutheran Church-Missouri Synod, guests are warmly welcomed by the presence of a life-sized painting of Christ standing in a wooded area. The Spitz Center houses the ministry's offices, 13 guest rooms with private baths, a chapel/ multi-purpose room which is capable of seating 175 guests, smaller meeting rooms, locker rooms and an indoor swimming pool, in addition to a modern dining room which can serve approximately 250, with delicious meals served buffet style.The Living Waters room has bunk accommodations for 6 people, and the Dayspring room serves as a small meeting room and overflow room for bigger groups. The Spitz Center also has a full guest laundry and vending area. All public meeting rooms, chapel, dining room, indoor pool and restrooms are also handicap-accessible, with an elevator serving all three building levels of the Spitz Center. Guestrooms are maintained with a queen-sized bed, queen sofa sleeper, linen and towel service, full bathroom with tub and shower, and a balcony or patio view of the woods and lake. One room is equipped as a handicap-accessible room. 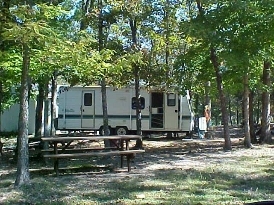 The Campground is a beautifully shaded woods area with 17 modern hook-up sites offering electricity, water, and sewer, level pads for motor homes or campers, and a separate grassy area for tenting. 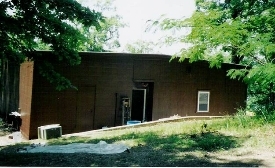 In the center of the campground is the Ascension Haus, a pavilion that can host up to 400 for picnics, with a full kitchen and storage area and lights for the night use. This pavilion is often used for movies, reunions, and picnics in the summer season. We have a total of 8 sites at 50 AMP. The rest are at 30 AMP. In addition there are 6 tent sites with electric and water. Cabin 1, 2, & 3 provide that rustic camping experience while still enjoying the airconditioning of a cabin. Through the support of our volunteers, stairs and an observation deck has been built to connect the cabin / bunk house area to the beach and lakefront. The Cabin area also has a playground for the kids with a gazebo with a magnificent view. Cabin 2 & 3 have decks that overlook the lake. The Blunk Bunkhouse, is built to house groups up to 60 persons, with 2 rooms for 14 each and 2 rooms for 16 each. It has centralized bathrooms that provide showers with changing rooms, toilets and sinks. 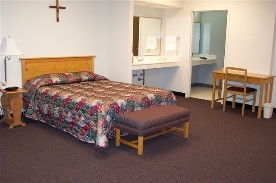 All rooms have heating and air-conditioning. The front area of the Blunkhouse is a common area suitable for a variety of different activities and relaxation. 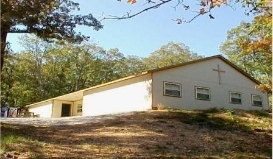 The Blunkhouse can be rented in its entirety or divided by quads to accommodate more than one group. The Cedar House offers a fully furnished kitchen, 2 bedrooms, 1 bathroom, central heat and air conditioning. The Cedar House sleeps 4-6, with a pull out couch in the living-room. The Gospel Hostel Bunkhouse is built to accommodate groups up to 48 persons with quad- style rooms, each room has bunk space for 12 and bathrooms that provide showers with changing area, toilets, and sinks. Each room has heat and air-conditioning. Within the center of the Gospel Hostel is a common area with kitchen and lounge area, the deck in the back is suitable for a variety of different activities and relaxation. The Gospel Hostel can be rented in its entirety or divided by quads to accommodate more than one group. The Bell House is built to accommodate groups up to 24 persons with 2 rooms of 12 each. Each room has its own bath with showers, toilets and sinks. It has heat and air-conditioning. The Lodge offers a fully furnished kitchen, 6 bedrooms, 3 1/2 bathrooms, one queen-sized pullout sofa, central heat and air conditioning. The Lodge sleeps 12 comfortably. The Counselor Cabin, "GCL" has two bunk rooms, each with 1 full size bed and 9 twin beds, two baths, and full kitchen. 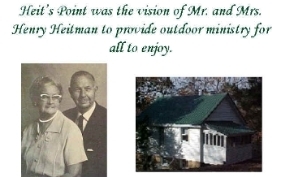 The newly updated Heitman House is a great place for 2 - 4 people to stay and enjoy the views of the lake. Tucked away on a small peninsula on the property it's a great place for a quiet weekend.